We had this photo sent in recently. If anyone has a match report or more information about the team, we would love to hear from you. Dublin Senior Football Finalists. Croke Park, June 1964. Back L-R: Billy Glavin; (Selector),Sean O`Neill, Jack Martin, Barney Lenehan, Frank Gilton, Jim Murphy, Noel Doolan, Ned Fahy, Donal Mulligan, Pat Hobbs, Mickey Griffin, Con Clarke;(Selector). 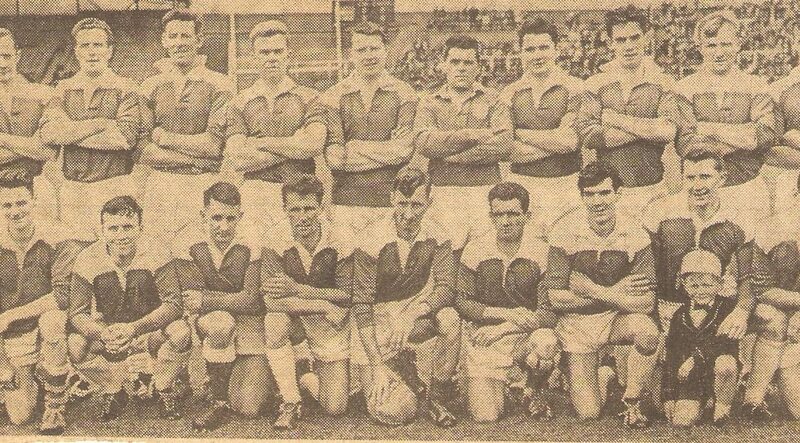 Front L-R: Tom Kennedy; (Trainer),Mick Healy, Paddy Delaney, Gerry Power, Paddy Byrne, Pat Synnott;(Captain),Dingers Byrne, Gerry Marry, Alex Morahan, Vincent Synnott. Absent, Mick Comer.